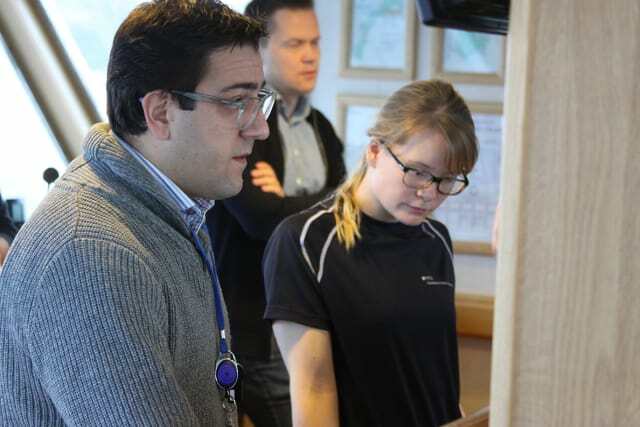 Students and researchers from the Norwegian University of Science and Technology (NTNU) were given the opportunity to test their own Dynamic Positioning (DP) algorithms in a full-scale setting last week. The trials took place in the Trondheimsfjord aboard the R/V Gunnerus, the NTNU-owned research and education vessel to which KONGSBERG donated a state-of-the-art K-Pos DP system in 2015. Called The AMOS DP Research Cruise 2016, PhD students and researchers were given access to the K-Pos system on R/V Gunnerus for a total of six days, allowing them to fully understand how their algorithm research and development translates to real-life operations at sea. It is believed that this is the first time that access to an industrial DP system platform has been provided for research and educational purposes, which was possible due to Kongsberg Maritime’s donation of the K-Pos system and on-going support of the R/V Gunnerus. The NTNU’s centre for Autonomous Marine Operations and Systems (AMOS) was awarded a Centre of Excellence (CoE) by the Research Council of Norway in 2013. AMOS is focused on creating a world-leading centre for autonomous marine operations and control systems. In operation for NTNU since 2006, the R/V Gunnerus is equipped with the latest technology for a variety of research activities within biology, technology, geology, archaeology, oceanography and fisheries. The vessel is arranged with a wet lab, dry lab and a computer lab in addition to a large aft deck, and is a key asset in research activities for the university. In addition to research projects, the ship is used for educational purposes and is an important platform for training courses at all levels and disciplines. As probably the most technologically advanced vessel operating on a daily basis in the Trondheimsfjord, the R/V Gunnerus is also regularly used as a highly efficient test-bed for technology developed by Kongsberg Maritime. KONGSBERG is heavily involved in R&D projects within the Trondheim region, having recently played a key role in establishing the Trondheimsfjord as one of the world’s first official test-beds for autonomous ships. Kongsberg Maritime enjoys close co-operation with Norway’s largest university NTNU, and the largest independent research organisation in Scandinavia SINTEF and its subsidiary MARINTEK (The Norwegian Marine Technology Research Institute).